Be a part of the Players' exciting 2019 Season of shows! As you consider your level of membership, remember that all money from memberships goes into the current year's programming. The Possum Point Players strive to keep our ticket rates reasonable. At a time of increased rates in both production royalties and energy costs, YOUR assistance is vital to continue our programming! Please Note: Our membership year runs from January through December. 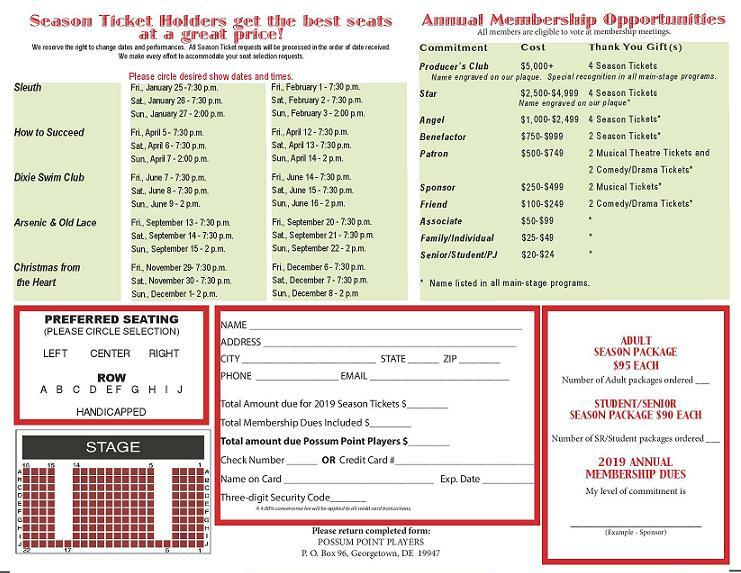 All members are listed in each show's program, and are eligible to vote at membership meetings. Click here for a printer-friendly version. Then just print, fill-in, and mail! Call us with your choices, then charge it over the phone or mail us a check!